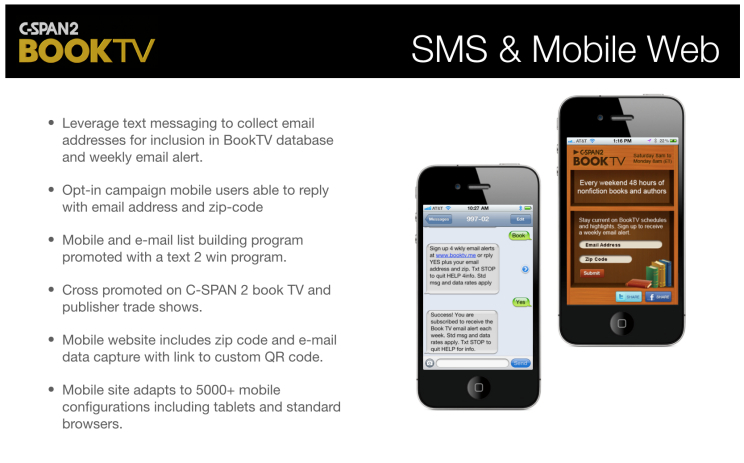 As a way to leverage text messaging to collect e-mail addresses for C-SPAN2’s BookTV database and weekly e-mail alert, ApolloBravo developed this opt-in campaign where mobile users are able to reply with e-mail addresses and zip codes. This mobile and e-mail list-building program was promoted with a text-to-win element and cross promoted on C-SPAN2 BookTV and publisher tradeshows. The mobile website includes zip code and e-mail data capture with a link to a custom QR code.